Small bowel imaging is a challenge in itself. Optimization of protocols gives the best results. CT is a superb modality for bowel imaging allowing depiction of changes in the bowel wall as well as in the adjacent mesentry & any associated secondary changes or unexpected pathologies as well which may not be depicted with conventional barium imaging. Also rest of the solid abdominal viscera are imaged in the same sitting. Optimal small bowel distension with intravenous contrast administration &portal venous phase acquisition helps identify the pattern of bowel wall affection. Protocols may be modified to acquire arterial phase images if vascular mapping is desired or vascular abnormalities are suspected. Also with the use of a neutral oral contrast, vessels are well depicted on 3D volume rendering techniques. Take home message - Carcinoids are rare neuro-endocrine tumors which can occur in a number of locations. 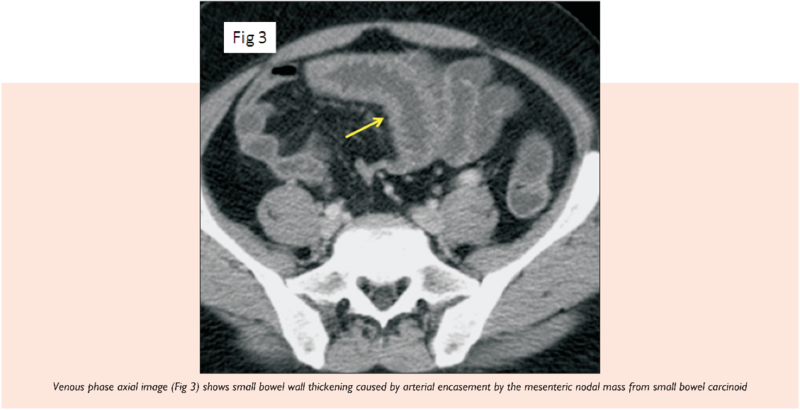 Brilliant post contrast enhancement of the bowel & adjacent mesentry with surrounding desmoplastic reaction are well described features indicating possibility of bowel carcinoid. Desmoplastic reaction around the mesenteric mass gives a spoke wheel appearance as is apparent in this case (Fig 1b). The GI tract accounts for approximately 85% carcinoid tumours while carcinoid accounts for around 2% of GI tract tumours. The appendix accounts for around 50% of all carcinoid tumours. The terminal ileum is the second most commonest site. Middle aged man presented with abdominal pain. He was referred for small bowel enteroclysis, however due to difficulty in intubation, CTenterography had to be performed. Contrast enhanced CT performed with neutral oral contrast & intravenous contrast with acquisition in the arterial & portal venous phase. Take home message - Carcinoids are relatively rare neuroendocrinetumors but are the second most common small bowel malignancy. Upto30 % small bowel carcinoids can be multiple as seen in this case. The desmoplastic response as described in the previous case is an important pointer on CT imaging towards the diagnosis of bowel carcinoid. Thetumor is very slow growing & can go unrecognized for years. These tumors most commonly occur in the fifth to sixth decade of life with average time from the onset of symptoms to the diagnosis exceeds 9 years .Also small bowel ischaemia can occur due to mesenteric vascular encasement & desmoplastic reaction causing symptoms of mesenteric ischaemia which could be an initial presenting clinical feature. Using arterial phase during CT imaging is important for depicting hepatic metastases & detecting vascular encasement. 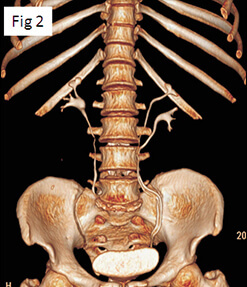 Elderly lady with right iliac fossa pain & features of subacute / incomplete obstruction. She had undergone abdominal surgery in the past (details not available) & had taken AKT as well. Take home message - Wall thickening with luminal narrowing are common feature of fibrostenosingChron’s disease. Pericolic fatty proliferation also corroborates with diagnosis of Crohn’s disease. Prominent pericolic vascularity depicting the Comb sign could be a marker of active disease. Absence of low attenuation necrotic nodes or calcified nodes help differentiating Crohn’s disease form ileocaecal Tuberculosis. Fistulae and sinus tracts can be seen with Tuberculosis but are much less common than in Crohn’s disease. This young gentleman who was a diagnosed case of Crohn’s disease came with onset abdominal pain & fever. Young gentleman presenented with weight loss & anaemia. His utrasound examination revealed multiple enlarged nodes. Take home message - Small bowel lymphoma is most commonly seen as secondary extra nodal involvement in widespread systemic lymphoma. When primary, it is predominantlyseen in patient with predisposing condition like AIDS, ceoliac disease, organ transplant ( post-transplant lymphoproliferative disorders) and patients with H.Pylori infection. The most common imaging features are wall thickening ranging from 1 to 7 cm & aneurysmal dilatation which may be seen in 30 % of the cases. Less frequently the disease may manifest as a solid mass lesion. 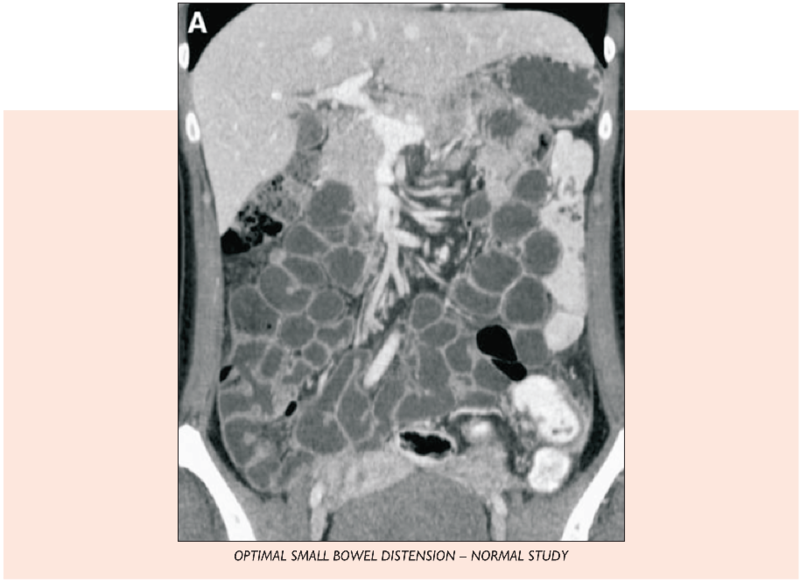 Despite the extensive involvement small bowel obstruction is uncommon and perforation is rare. Regional lymph node enlargement is seen inapproximately 50% of cases. Take home message - Neurofibromas may involve the skin, soft tissues, or viscera. Gastrointestinal involvement in NF1 is reported to occur in 10%–25% of patients. Neurofibromas are the most common neoplasm of the gastrointestinal tract in patients with NF1. The majority of gastrointestinal neurofibromas in NF1 are clinically occult. There are five categories of NF1 tumors that occur in the abdomen: neurogenic, neuroendocrine, and non-neurogenic gastrointestinal mesenchymal, embryonal, and miscellaneous. Elderly man a known case of ulcerative colitis came for imaging as he suffered from recent exacerbation of symptoms. Take home message - Target appearance with submucosal fat deposition is known in ulcerative colitis. In patients with pancolitis or longstanding ulcerative colitis, the risk for colon cancer is markedly increased. Such a neoplasm can be visualized on CT images as an apple-core–like or plaque like lesion. Optimal distension of the large bowel with neutral contrast and portal venous phase imaging can help depict lesions at an early stage. Clinical details - Elderly gentleman gave history of abdominal pain & constipation for many months. Colonoscopy had revealed a mass in the transverse colon. Take home message - Colonic intussusception is less common as compared to small bowel intussusception. It may either be ileocolic or colocolic. However, colonic intussusceptions are usually malignant and have clinically important differences from their small-bowel counterparts, such as a more frequent need for surgery. They are rarely transient or idiopathic in contrast to the small bowel intussusceptions. The clinical features could be abdominal pain, GI bleed, constipation or obstruction. Colonic lipomas are second most common benign lesions of the large bowel after adenomatous polyps but are far less common. Caecum is the most common location followed by the right colon.